PRODUCT: Estwing E3-S Solid Steel Shingle Hatchet with Adjustable Gauge. Polished milled face and shock resistant nylon vinyl handle grip. 12-1/2 inch long x 1-7/8 inch cutting edge. Price/Each. 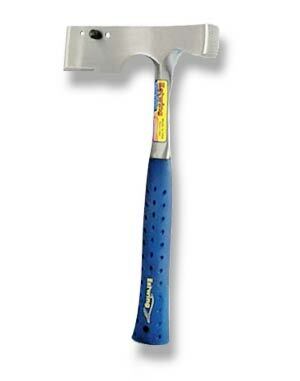 DESCRIPTION The Estwing solid steel shingler's hatchet has a replaceable gauge. It has a bonded and molded Shock Reduction Grip that reduces shock up to 70% and will not come off. The head and handle are forged in one piece and are fully polished for a nice look. This tool has unsurpassed balance and temper. Made in the USA. Always wear safety goggles.